Estimates of water use in the United States indicate that about 410 billion gallons per day (Bgal/d) were withdrawn in 2005 for all categories summarized in this report. This total is slightly less than the estimate for 2000, and about 5 percent less than total withdrawals in the peak year of 1980. Freshwater withdrawals in 2005 were 349 Bgal/d, or 85 percent of the total freshwater and saline-water withdrawals. Fresh groundwater withdrawals of 79.6 Bgal/day in 2005 were about 5 percent less than in 2000, and fresh surface-water withdrawals of 270 Bgal/day were about the same as in 2000. Withdrawals for thermoelectric-power generation and irrigation, the two largest uses of water, have stabilized or decreased since 1980. Withdrawals for public-supply and domestic uses have increased steadily since estimates began. Thermoelectric-power generation water withdrawals were an estimated 201 Bgal/d in 2005, about 3 percent more than in 2000. In 2005, thermoelectric freshwater withdrawals accounted for 41 percent of all freshwater withdrawals. Nearly all of the water withdrawn for thermoelectric power was surface water used for once-through cooling at power plants. Twenty-nine percent of thermoelectric-power withdrawals were saline water from oceans and brackish coastal water bodies. Withdrawals for irrigation in 2005 were 128 Bgal/d, about 8 percent less than in 2000 and approximately equal to estimates of irrigation water use in 1970. In 2005, irrigation withdrawals accounted for 37 percent of all freshwater withdrawals and 62 percent of all freshwater withdrawals excluding thermoelectric withdrawals. Irrigated acreage increased from 25 million acres in 1950 to 58 million acres in 1980, then remained fairly constant before increasing in 2000 and 2005 to more than 60 million acres. The number of acres irrigated using sprinkler and microirrigation systems has continued to increase and in 2005 accounted for 56 percent of the total irrigated acreage. Water withdrawals for public supply were 44.2 Bgal/d in 2005, which is 2 percent more than in 2000, although the population increased by more than 5 percent during that time. Public supply accounted for 13 percent of all freshwater withdrawals in 2005 and 21 percent of all freshwater withdrawals excluding thermoelectric withdrawals. The percentage of the U.S. population obtaining drinking water from public suppliers has increased steadily from 62 percent in 1950 to 86 percent in 2005. Most of the population providing their own household water obtained their supplies from groundwater sources. Self-supplied industrial water withdrawals continued to decline in 2005, as they have since their peak in 1970. Self-supplied industrial withdrawals were an estimated 18.2 Bgal/d in 2005, a 30-percent decrease from 1985. An estimated 4.02 Bgal/d were withdrawn for mining in 2005, which is 11 percent less than in 2000, and 18 percent less than in 1990. Withdrawals for mining were only 58 percent freshwater. Livestock water use was estimated to be 2.14 Bgal/d in 2005, which is the smallest estimate since 1975, possibly due to the use of standardized coefficients for estimation of animal water needs. Water use for aquaculture was an estimated 8.78 Bgal/d in 2005, nearly four times the amount estimated in 1985. Part of this increase is due to the inclusion of more facilities in the estimates in 2005, and the use of standardized coefficients for estimating aquaculture use from other data. Fresh surface water was the source for a majority of the public-supply, irrigation, aquaculture, thermoelectric, and industrial withdrawals. Nearly 30 percent of all fresh surface-water withdrawals in 2005 occurred in five States. In California, Idaho, and Colorado, most of the fresh surface-water withdrawals were for irrigation. In Texas and Illinois, most of the fresh surface-water withdrawals were for thermoelectric power generation. About 67 percent of fresh groundwater withdrawals in 2005 were for irrigation, and 18 percent were for public supply. More than half of fresh groundwater withdrawals in the United States in 2005 occurred in six States. In California, Texas, Nebraska, Arkansas, and Idaho, most of the fresh groundwater withdrawals were for irrigation. In Florida, 52 percent of all fresh groundwater withdrawals were for public supply, and 34 percent were for irrigation. 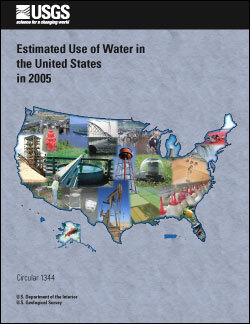 Kenny, J.F., Barber, N.L., Hutson, S.S., Linsey, K.S., Lovelace, J.K., and Maupin, M.A., 2009, Estimated use of water in the United States in 2005: U.S. Geological Survey Circular 1344, 52 p.